Softball facts illustrate the funny origin story of this sport. In 1887, after waiting for the results of a football game between Yale and Harvard in Chicago, a Yale supporter tossed a boxing glove at someone rooting for Harvard. Softball facts tell us that the Harvard supporter grabbed a stick, and swung at the balled up boxing glove. Legend has it that George Hancock then yelled, “play ball”, and the first ever game took place right there at the Farragut Boat Club on Thanksgiving Day, 1887. Over the next week, George Hancock developed a ball and bat. 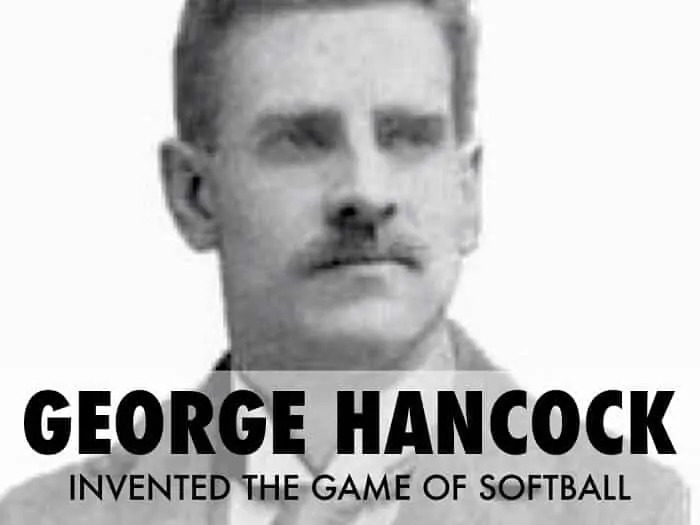 He is credited as the creator of softball. Some people think of softball as women’s baseball, but softball facts indicate the sport has differentiated itself from baseball and has both male and female players. Initially, softball was thought of as a good way for baseball players to hone their skills indoors during the winter months. The softball diamond is smaller than a baseball diamond. A baseball diamond has 90 feet between each base, whereas a fastpitch softball diamond has bases 60 feet apart. In 1888, the sport moved outside, and rules were finally published in the following year. Softball facts tell us that the first softball had a 16-inch circumference. That is 7 inches larger than the circumference of a baseball. Later, a 12-inch ball was adopted for fastpitch and 11-inch ball for slowpitch softball. 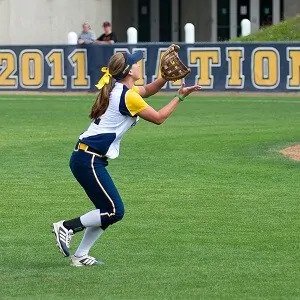 Both baseball and fastpitch softball have 9 fielders. Slowpitch softball requires 10 fielders. There are other small rule differences between the two games, but someone watching would find them very similar. The United States has both a men’s and women’s national softball team. These teams play in championship games in Oklahoma and abroad. 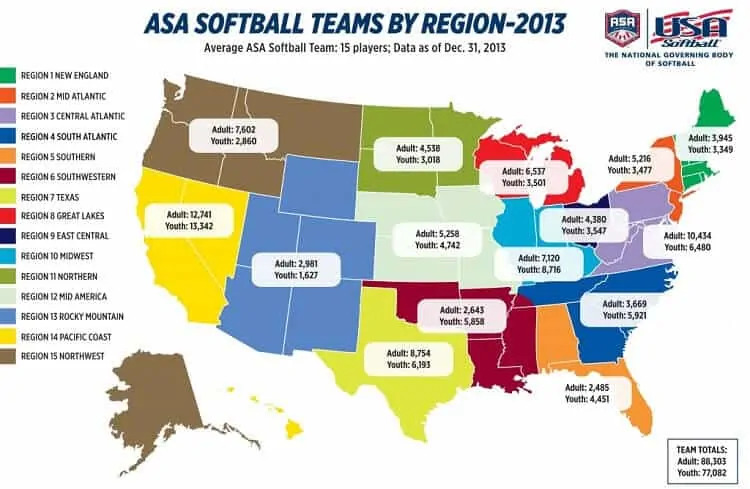 Softball facts reveal that within the United States, the Amateur Softball Association of America is the governing organization for softball. This group organizes the annual World Championships. Internationally, the World Baseball Softball Confederation, or WBSC, governs the game in over 140 countries, including the United States. The World Baseball Softball Confederation was formed in 2013 and is headquartered in Lausanne, Switzerland, home of the International Olympics Committee. The International Softball Federation was previously the governing group. Softball facts tell us that women’s fastpitch softball was first included in the 1996 Olympic Summer Games in Atlanta, Georgia. The United States won the gold medal the inaugural year. Women’s fastpitch softball was also included in the 2000, 2004, and 2008 Summer Olympics in Sydney, Australia; Athens, Greece; and Beijing, China, respectively. The United States won gold in 2000 and 2004. 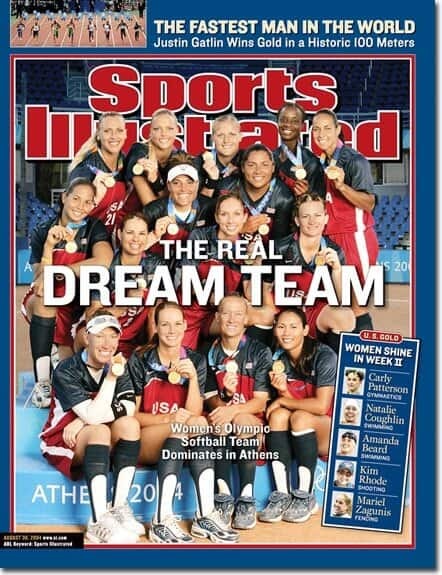 The United States won silver at the last Olympic games to feature softball, in 2008. Japan took home the final softball gold medal. The decision to drop women’s fastpitch softball from the Olympics was made in 2005. Until the International Olympics Committee reinstates it as an Olympic sport, the 2008 Beijing Summer Olympic Games will stand as the last Summer Olympics to have a softball medal. One of the shocking and deflating softball facts is that women’s fastpitch softball and baseball were the first sports to be dropped from the games in 69 years. The last sport to be dropped was polo. Not all hope is lost, however, as there are groups trying to get women’s fastpitch softball into the 2020 Summer Olympics. There are two types of softball recognized by the Amateur Softball Association: fastpitch and slowpitch. In the Chicago area, where softball originated, there is still a variant of the original game called 16-Inch Softball or mushball. Fastpitch softball is played with a slightly bigger and heavier softball than slowpitch. Softball facts show us another difference between fastpitch and slow pitch is that the fastpitch field is slightly smaller than the slowpitch field. Only fastpitch softball is played at the national and international levels. Unlike baseball, there is no professional softball league in the United States. The United States are represented in international play by one women’s team and one men’s team, referred to as Team USA. The members of Team USA are selected players from college teams and some individuals who show promise at ASA tournaments. Team USA participates in the World Cup in Oklahoma, the World Championship, and the Pan-American Games, as well as other international games and exhibitions. Though softball is no longer played during the Olympics, international play continues yearly at the Softball World Championships. The World Baseball and Softball Confederation hosts several categories of international play including both women’s and men’s softball world championship games as well as baseball championship games. Men’s and women’s softball championships are held in alternate years. Softball facts show women’s fastpitch softball world championships are held in evenly numbered years, while the men’s championship is played during odd years. The Pan-American Games, which are held every four years, feature softball as one of the sports. The ASA also holds a yearly World Cup tournament in Oklahoma. The Amateur Softball Association (ASA) maintains a Hall of Fame for softball players. Currently, there are 197 players recognized. The ASA also recognizes important non-players, such as coaches and umpires. There are 169 non-players currently recognized by the Hall of Fame. The ASA Hall of Fame is located in Oklahoma City, where softball facts tell us the ASA is headquartered. The Hall of Fame was dedicated in 1973, and includes players from as early as 1941. Mushball, or 16-Inch Softball, is still played in Chicago. Softball facts show that this variation on the original softball game has continued in its hometown. A larger, softer ball is used, reminiscent of the balled up boxing glove used in the first game. In addition, no fielding mitts are used. The original style of softball really is a hands-on sport! While softball facts indicate there are 197 softball players in the Hall of Fame, there is only one player currently inducted who played Chicago-style 16-Inch Softball. Eddie Zolna was inducted in 1989. He won 12 national titles as a pitcher with the Bobcats and was MVP three times in national championships. During the last three summer Olympics featuring softball, the United States Women’s fastpitch softball team held on to an amazing 22-game winning streak. That streak lasted from 2000 to 2008, and softball facts tell us the streak ended in the gold medal game against Japan. Interesting softball facts show that the first time an Olympic softball pitcher pitched a solo no-hitter was at the 2000 Summer Olympics. American Lori Harrigan set the record against Canada in women’s fastpitch softball. We can only guess that, due to the larger circumference of the softball, it may be easier to hit than a baseball, even though the bats are smaller. Given these softball facts, it may be that Lori Harrigan is the greatest pitcher of all-time in softball and baseball. Justice Elena Kagan was appointed to the United States Supreme Court in 2010. Softball facts indicate that she played 16-Inch softball while she taught at the University of Chicago Law School. We wonder when she is hearing cases whether she pictures the attorney’s remarks as big mushballs flying through the air, waiting to be swatted down. Jokes aside, we’ve got to credit Justice Kagan for playing the original style of softball as it’s played in Chicago. Softball facts show that softball is a popular game derived from baseball. There are two types, fastpitch and slow pitch, and both are governed nationally by the Amateur Softball Association. Team USA represents the United States in international softball games. Softball is not currently an Olympic sport, but there are groups who are going to bat for softball with the Olympic committee to bring the sport back.